Each worship leader has a golden opportunity at his/her fingertips. The church you serve is unique. It has its own history, its own demographics, and its own classics. There is power in these classics to intensify the worship of the congregation as they come together each week to glorify God. There is power here to unify the generations before you in mutual proclamations of praise, expressions of adoration, and seasons of prayer. It is the responsibility of the worship leader to discover these classics for each church has a different list. Along the way the worship leader will discover who the people are he/she is leading and will identify their passions for God and the works God is doing in their lives. Just what is a classic? Most music runs as swiftly as a white-water stream through the culture that produced it. These are temporary songs and compositions that are born in a moment and serve that moment before passing gracefully into the past. Their message is no longer current. Their style is passé. The only use of such music is one of nostalgia, bringing old feelings back around for a brief, emotional visit. A very few songs and pieces of music transcend the year, the era, the location, the culture of the moment of their creation. Their message remains current. Their style transcends time and these masterworks continue to speak to generation after generation. This why the great popular songs of the 1920s-1940s still live on today—the are so well-written that the transcend their origins on Broadway or in the movies to become jazz standards that all subsequent jazz players must learn and all serious singers have to reinterpret. Classics earn the right to be heard in every generation. To help a friend out, I played 3rd clarinet in his college band. One day as the aforementioned “unfinished symphony” was under way, I tried an experiment. I played the opening lines of the 3rd movement of the Mozart Clarinet Concerto. The young man sitting first chair clarinet suddenly looked up at me, smiled the biggest smile and played along. Because, even though he was not yet 20 years old and I learned that piece more than 40 years ago, he had also played the Mozart Concerto. Every serious clarinet player has played it. It is a classic. With that impromptu duet, the years between us melted away and the love of the instrument we shared brought us together. In this same way the classics serve a vital function in every culture—they bind the people together across chasms of culture that they cannot span otherwise. In his important book, Jubilate!—Church Music in Worship and Renewal, Dr. Donald Hustad, describes worship music as the “tribal music” of the church. He defines tribal music as music that expresses the values, identity, and common beliefs of a society. Worship music certainly meets this definition and functions in this way. 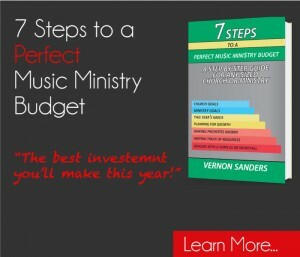 This is an important truth for worship leaders to know and use in our ministries. There is no reason for the old and the new to be in conflict in worship. The conflict comes in an atmosphere of rejection when advocates of one reject the use of the other. This should not be surprising since worshipers hold their music close to their hearts. To reject a person’s worship music is, in some ways, to reject that person. For the church to progress and enjoy both the best of tradition and the creativity of today, leaders must be creative in the selection and presentation of worship music. 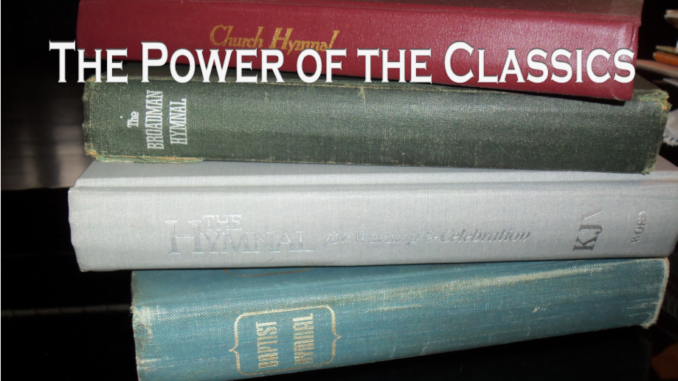 The effective use of the classics of the church can be quite helpful, even essential, to the expansion of the musical and spiritual possibilities for worship services. In other words, careful leadership concerning the traditions of the church can serve to release the church into more innovation in worship. In other words, the worship leader should learn the songs that are meaningful to the congregation if he/she plans on adding new music to the repertoire of the church. I call this leadership the “common ground to higher ground” principle. It is necessary to meet the people where they are—common ground—and move together to higher ground—progress in the things of God. In addition to the local traditions of the church, there are at least two other categories of important classics: patriotic songs and historical hymns. These songs have transcended the details of their composition to belong to the ages. They are reborn in every generation, rephrased in the musical languages of succeeding eras, and do exactly what Hustad said they should do. They celebrate who we are, what we believe, and what we share. Personally, my reaction to these pieces has been one of utility. I think the people I lead in worship should know that we have a National Hymn. So I lead God of Our Fathers at least one a year. If I have a choir and orchestra, I feel it is my duty that they know classics like Handel’s Hallelujah and Wilhousky’s Battle Hymn of the Republic. It goes without saying that the traditional songs of Christmas and Easter and the great songs of classic Christian worship are a treasure trove to each congregation and can be a useful tool set for every worship leader. Plan all the Sundays of Advent and Christmas at one sitting so that more seasonal songs can be scheduled and unintentional repetition can be avoided. Tell a different part of the Christmas story each week—songs about the shepherds one week, the wise men another week, the angels on another, etc. Separate Memorial Day Sunday from Independence Day Sunday this way: Memorial Day was the day to honor the military. Independence Day Sunday was a celebration of American Liberty and a time to pray for America. Appropriate programing of traditional pieces helps them flow and function in special services. The classics should never been done for reasons other than the contribution they make to the worship service. When programming the classics we should always do them justice. This is not to say that we cannot be creative—creativity is essential to worship leading. One Christmas service I heard a jazz waltz version of Silent Night that was fast, loud and frantic. I could tell there was no thought given to “the feeling of the meaning of the words,” to use Carol Owen’s wonderful phrase. I wanted to call it Noisy Night. Our creativity must be tempered by a respectful consideration of the original feel and message of the song. With the advent of computer helps like Planning Center, this is easier to accomplish than ever but when it comes to the classics, good record keeping is vital. Because some songs are familiar, it may seem that we use them more often than we actually do. The worship leader must keep these things straight in the mind and on the computer. As new songs come on the cultural scene and enter the repertoire of the church, in time some of them will become classics. Just a few years ago, God Bless the USA, was a new popular song but today it could be rightly considered a new classic. Churches tend to wear out popular worship songs in just a few years. A few of these will linger beyond the time of their composition. Recognizing these standards-in-the-making, is an important skill. Well planned worship should unfold without the need of excessive patter. It is not good make reference to whether a song is new or old or a new arrangement. Put the music together well and let the songs speak for themselves. With intentional and skillful use of the classics of the church the dividing decades between younger worshipers and their elders can fall away just as the Mozart Clarinet Concerto did for my young clarinetist friend and me.